KCHR conducted a half day seminar on the Academic Contributions of Professors T.K Ravindran, M.G.S Narayanan and K.N Panikkar as part of the programme 'Panditha Aadaravu 2018' from 9.00 am to 2.00 pm on 12th July at Sonata Hall, Mascot Hotel, Thiruvananthapuram. 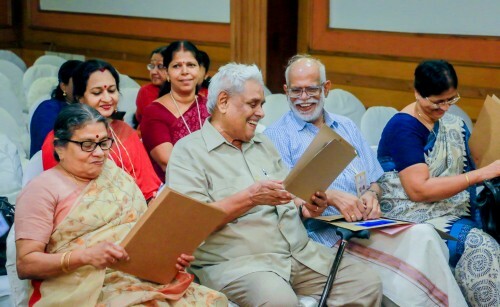 Professor Suresh Jnaneswaran, Professor Kesavan Veluthat and Professor K.N. Ganesh presented about the academic contributions by Professors T.K. Ravindran, M.G.S Narayanan and K.N. Panikkar. Professors T.P Sankarankutty Nair, V. Karthikeyan Nair, and Jaiprakash Raghaviah chaired the sessions.